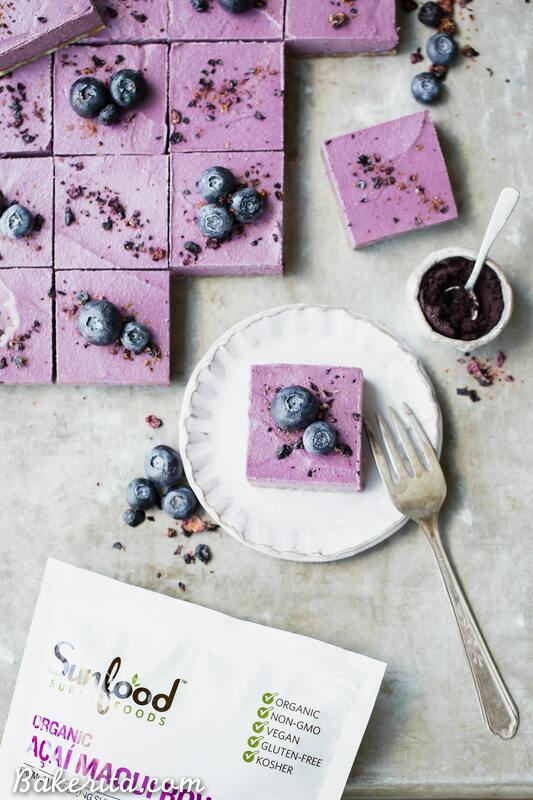 These creamy No-Bake Acai Maqui Berry Bars are full of antioxidants from acai + maqui berry powder – it’s a punch of superfood power packed into a healthy and delicious dessert! These gluten-free, paleo and vegan bars are so refreshing – no baking necessary. Thanks to Sunfood for sponsoring this post! Raise your hand if you’ve had acai in something other than a smoothie bowl? … Not many hands up? This isn’t a bad thing – acai bowls are so dang good. I just find it sad that we have acai relegated to our breakfast bowls and rarely made it into desserts. This is likely because we can’t get the fresh berries themselves here in the US. Thankfully, we do have a way to get acai berries in powder form! 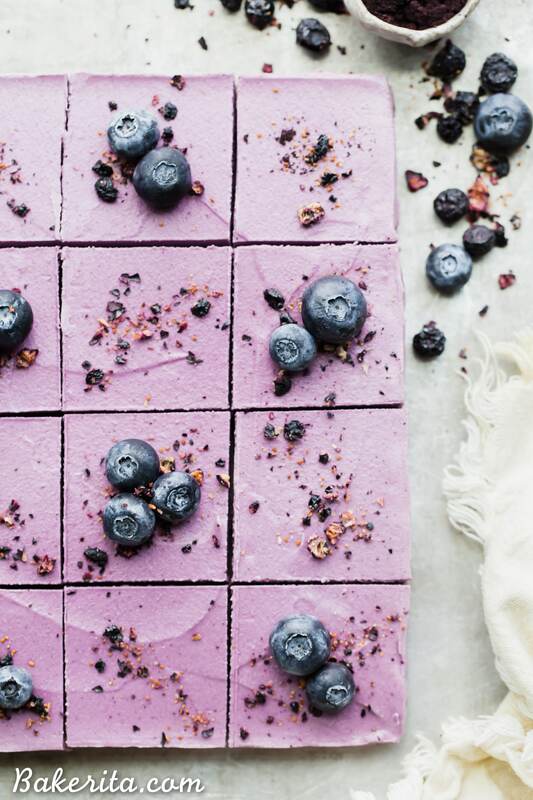 That makes it super easy to add to all sorts of desserts…like these Acai Maqui Berry Bars. They are creamy, tart, and absolutely delicious. You might be wondering what maqui berries are though! These superfood berries are native to Chile and are loaded with nutrients and antioxidants, like calcium, iron, vitamins A, C, B1 & B3. The maqui berry powder is also super flavorful and delicious. 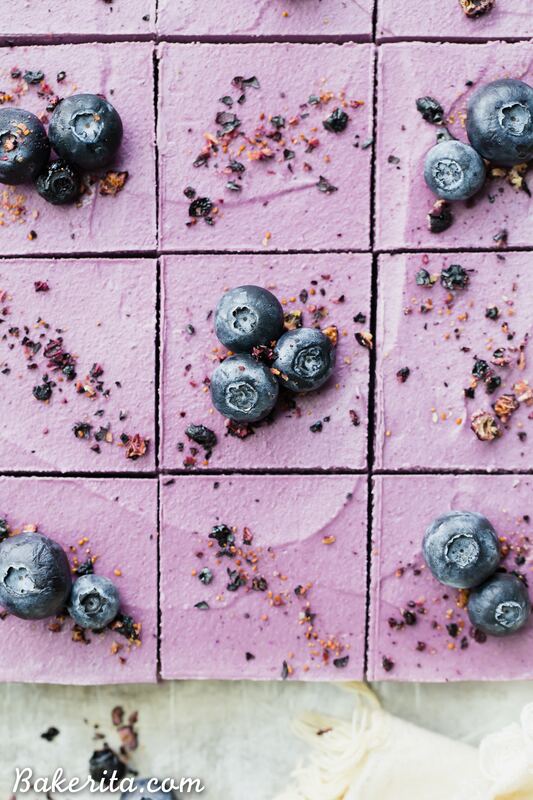 Let’s get nutritious with these No Bake Acai Maqui Berry Bars. All the extra superfood ingredients in the mix add even more nutrients to these bars, but if you have pure acai and/or maqui berry powder at home, you can use either of those too. We pair the mix with lemon juice for extra tartness, and then blend it up with coconut cream, soaked cashews, maple syrup, and coconut oil. The creamy filling is on top of a simple coconut & date crust. 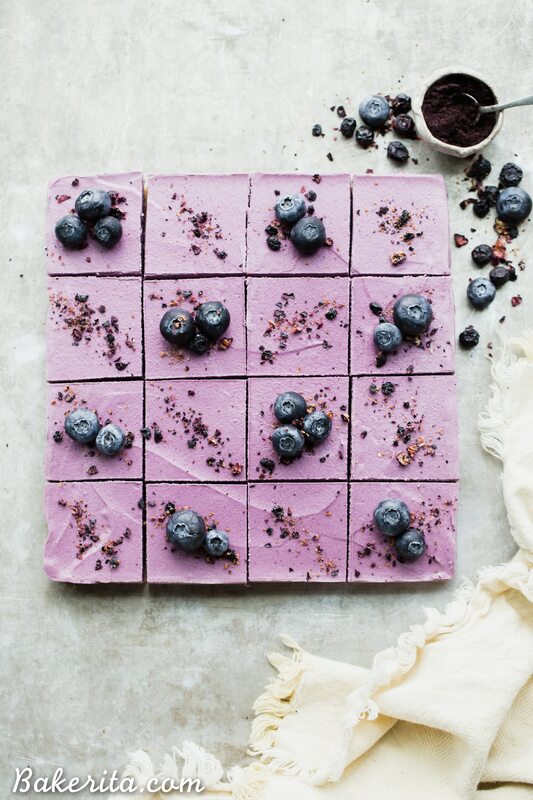 This stunningly purpled-colored, super creamy Acai Maqui Berry Bar is the result. They have a tangy berry flavor that pairs perfectly with the coconutty crust, and looks stunning on its own or garnished with some fresh blueberries. I like ’em frozen for a super refreshing treat, especially in this San Diego summer heat. However, you can also store them in the fridge if you like them a little softer. Either way, they’re DELISH. Enjoy, my lovelies! 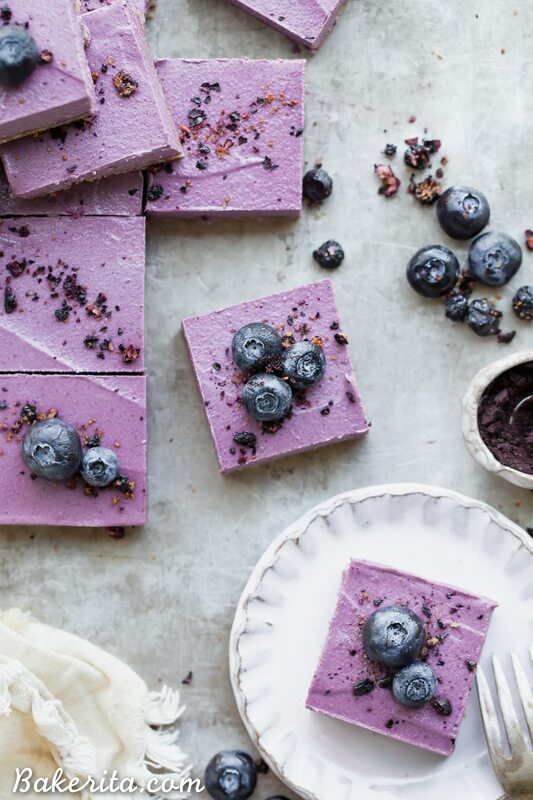 These Creamy No-Bake Acai Maqui Berry Bars are full of antioxidants from acai + maqui berry powder - it's a punch of superfood power packed into a healthy and delicious dessert bar! These gluten-free, paleo and vegan bars are so refreshing - no baking necessary. Line an 8x8” pan with parchment paper and grease with coconut oil. Set aside. Add the coconut, almond flour, pitted dates, coconut oil and salt to a food processor or high-powered blender and pulverize until it comes together into a sort of sticky dough, with small bits remaining. Don’t over process, or it’ll turn into nut butter! Press the date dough evenly along the bottom of the prepared pan. In the same food processor or high-powered blender (no need to wash between - I used my Vitamix, but most powerful blenders should do the job), combine all of the filling ingredients and blend for 2-3 minutes, or until the mixture is silky smooth and creamy. Scrape down the sides as necessary. Place on a flat surface in the freezer to firm up for at least 3 hours before cutting. I recommend running your knife under hot water to warm it up before cutting the bars with the still-hot (dried) knife. Let them thaw at room temperature for 10-15 minutes before serving. You can also pour boiling/very hot water over the cashews and let them sit for about an hour if you want to speed up the process - it won't be quite as creamy as soaking for longer, but it will do the trick! These bars are so pretty and the perfect way to beat the heat! what is this açaí berry mix? and oh how beautiful your creation! !